Major differences between decking systems include shoring requirements and how furring strips for finishes are attached. Since their invention nearly 15 years ago, EPS decking products have gained considerable popularity, especially in the ICF industry. 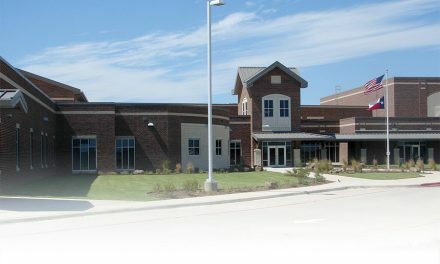 Made from rigid foam and topped with steel-reinforced concrete, they offer many of the same advantages as ICF walls: strength, thermal mass, better insulation, sound attenuation, and protection from natural disasters. 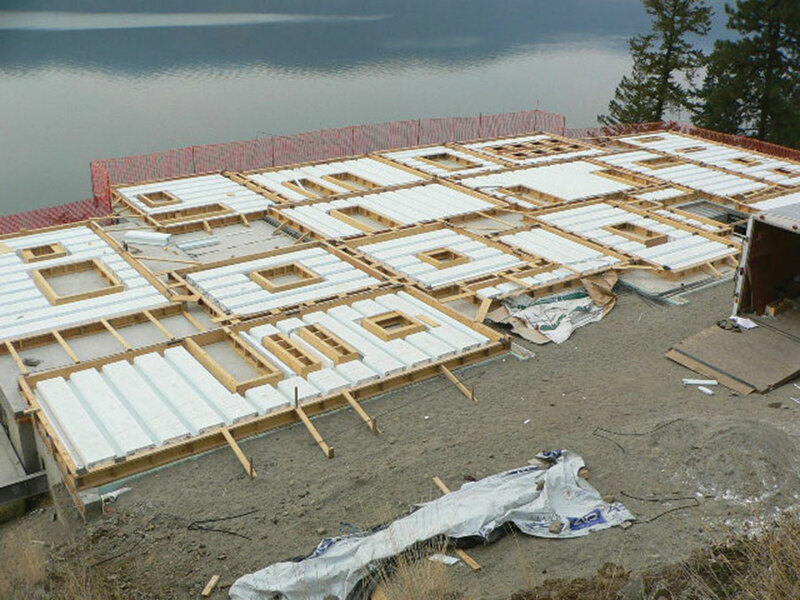 They work exceptionally well with in-floor radiant heating systems, which are common in ICF projects, and offer increased design flexibility, and openness as clear spans of more than 20 feet are easily achieved. Besides being used to create durable floors, decks and patios, EPS decking is used to create safe rooms, earth-covered and/or green roofs, and living space under garages. A few builders are even using them for tilt-up construction, or using them in sloped, gabled roofs which are highly insulated and virtually indestructible. A half-dozen different systems are currently on the market, each with advantages and shortcomings. Piero Cretti patented the first EPS decking material, now sold as Insul-Deck, in 1978. (It’s also sold under the Quad-Deck name.) LiteForm Technologies introduced Lite-Deck in 2000. Both these systems are based around long EPS panels, two feet wide and as long as the job requires. They’re delivered to jobsite custom cut to length, and are available in a variety of thicknesses, depending on the distance to be spanned. Light gauge steel studs are molded into the panels (Insul-Deck) or inserted after molding (Lite-Deck) every 12 inches on center to serve as attachment strips for the drywall. Plank systems are especially suited for tilt-up and sloped applications. Because they’re a single piece, they’re usually the best choice for sloped roofs or tilt-up work. At first glance, the two brands appear quite similar, but there are a few key differences. 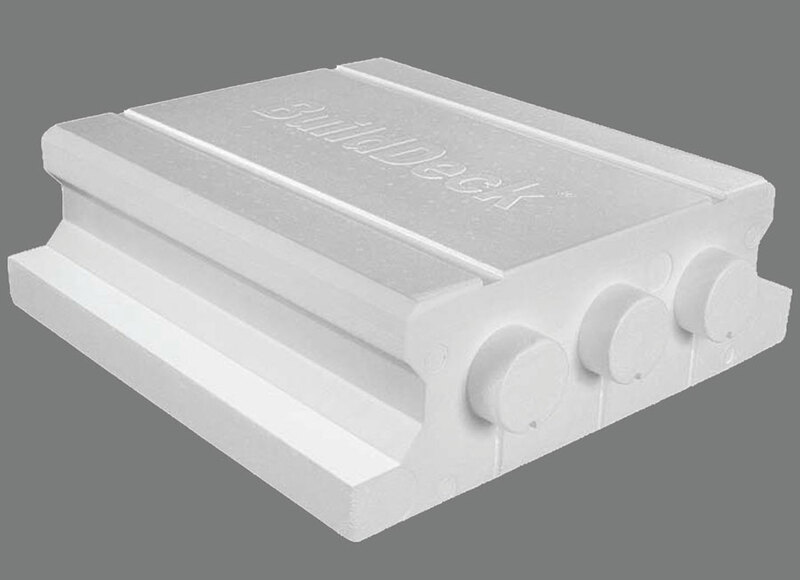 Insul-Deck features two 4 ½” diameter utility chases pre-molded into the foam. That makes it somewhat easier for electricians and plumbers, although the chases run parallel with the furring strips only. LiteDeck typically is delivered without chases, but they can be precut if desired. Otherwise, chases can easily be cut into the foam with a hot knife or other tool. Note that these can accommodate electrical work and some vent piping, but HVAC and other mechanical ducting will not fit in the joist space, as it would with steel joists. This holds true for all foam decking systems discussed in this article. 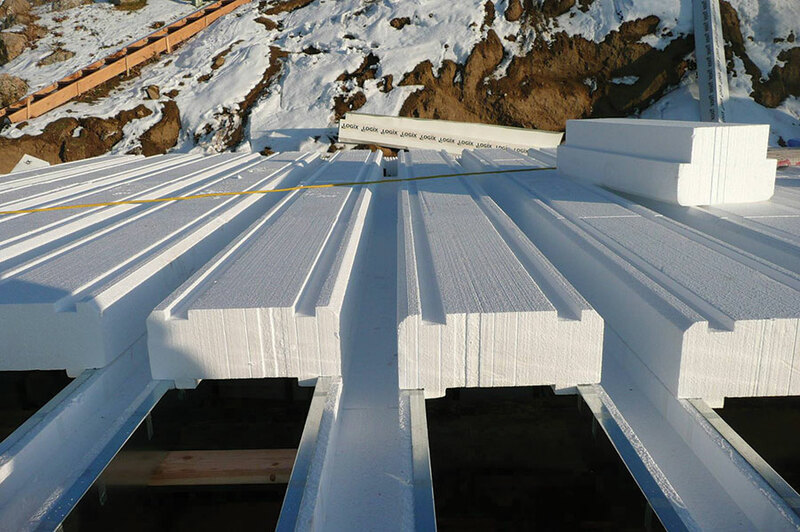 The Insul-Deck system is produced in thicknesses from 7″-12.5.” Lite-Deck adjusts the depth of the beam pocket through “Top Hats”, foam planks that are glued onto the top of the deck system to allow longer spans and/or higher live-loads. Lite-Deck Top Hats, available in 2″-thick increments are made from post-consumer recycled foam, which may contribute to LEED or NAHB Green certification. Insul-Deck also offers a similar product for applications that require additional foam. In 2006, Amvic introduced the first modular EPS decking system. Named AmDeck, the foam components are 32 inches wide by 24 inches long. 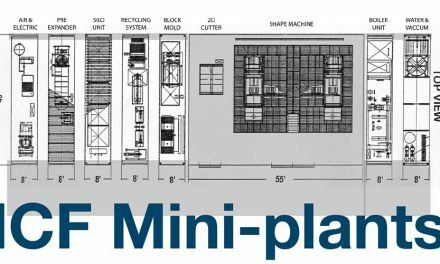 By using standardized, lightweight units, Amvic created system that is easier to handle, easier to ship, and easier to modify. It’s also easier to adjust quantities to jobsite conditions since nothing needs to be special ordered, and leftover forms may be saved for future projects. AmDeck, which uses locally-purchased steel joists, requires only half the shoring plank systems use. The blocks are supported by locally-purchased steel joists, placed 16 inches on center to match the slots molded into the foam. 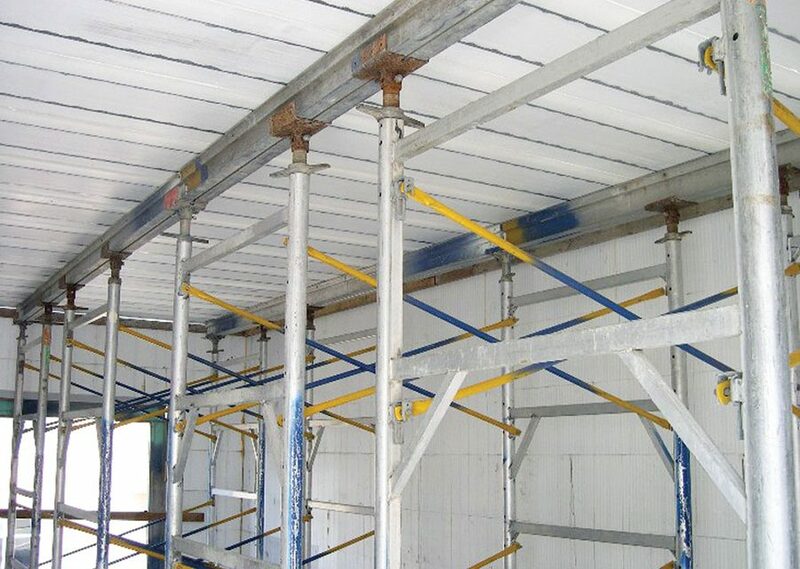 Because AmDeck uses actual steel joists, instead of light-gauge furring strips, shoring can be placed as far as 15 ft. on center, instead of the usual five or six feet required by Insul-Deck and LiteDeck. The blocks have a reversible interlock to ensure they stay connected. AmDeck is currently made in just a single 12″ thickness (10″ beam pocket), which is more than most applications require, considering that it’s capable of bridging 30′ clear spans. In September of 2009, BuildBlock Building Systems rolled out a different modular decking system, called BuildDeck. The components are slightly smaller than AmDeck, each piece measuring 24″x24″, and has no integral joists or furring strips. BuildDeck does offer a steel furring strip option; these are 20 gauge C-channels clipped to the edge of the form (which become the bottom of the beam pocket). The foam pieces are available in three depths (8, 10, and 12 inches) so shallower beam pockets are available for shorter spans. It’s perhaps the most affordable ICF decking systems currently available if the cost of the components is the only consideration. BuildDeck is one of the most affordable decking systems, but also one of the most labor-intensive to install. However, when labor is considered, the equation changes significantly. BuildDeck requires significantly more shoring than any other system. Manufacturer guidelines recommend shoring every 24″ on center. That’s double or triple what the plank systems recommend, and eight times the shoring required by AmDeck. Also, the standard form without furring makes attaching drywall much more difficult. In 2011, LiteForm introduced their own modular system. The foam components are available in eight-foot lengths and instead of integral furring strips, the new system uses locally purchased lumber. The most common profile uses conventional 2x6 lumber (or a light-gauge steel beam of the same size). An even “greener” profile uses a 11 7/8” I-joist ripped lengthwise for support. The Wood Rib System is dubbed WRS. The light-gauge steel version is called SRS. “Basically, it’s an ultra-versatile, carpenter-friendly EPS decking system intended for creating insulated concrete floors,” explains Dave Hall, marketing manager at LiteForm Technologies. 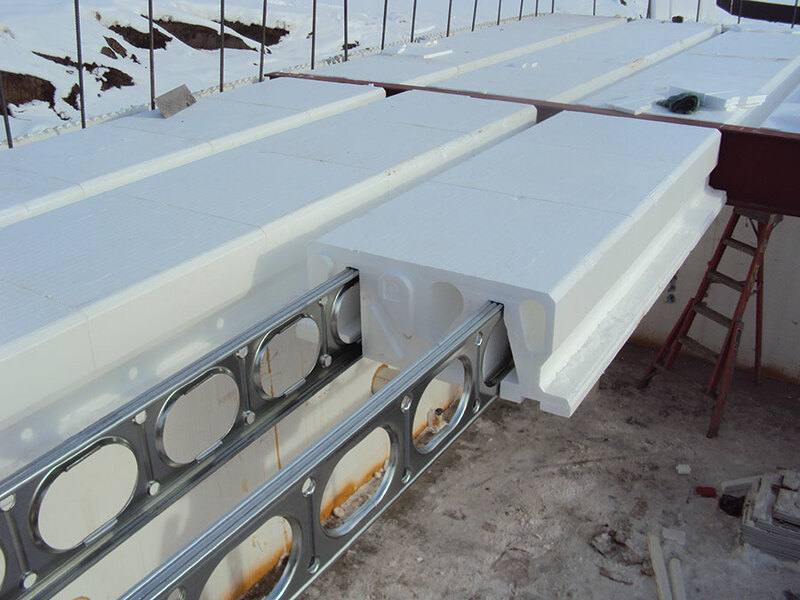 “This is a carpenter-friendly system that uses materials available at every jobsite in North America.” Shoring requirements and installation methods are similar to the regular Lite-Deck product. WRS is compatible with Lite-Deck “top hats,” and can create clear spans of up to 50 feet. Builders can also order WRS decking in custom lengths, or with the ribs (2x6, I-joist, or light-gauge steel options) pre-installed, direct from Lite-Form headquarters in Iowa. LiteForm recently introduced its own modular decking system, the wood-rib WRS (left) and steel SRS (right). One advantage shared by some of the modular systems is the safety factor of having the ceiling finish mechanically fastened to the concrete floor above it (BuildBlock recommends 3 ½’ screws that tie the furring strings into the concrete.) Other systems’ furring strips could fail in a fire as the foam around them melted away. In early 2011, a new style of EPS decking arrived on the market. These hybrid systems are neither plank nor modular, but offer some of the advantages of both. Op-deck, made by a Dutch company named Reppel, consists of a layer of foam sandwiched between two metal panels. It has the ability to support a layer of wet concrete across 20 foot spans without shoring, and offers an unlimited number of attachment points for finishes. However, all that steel adds up. The weight of a 5′ x 20′ panel is close to 300 lbs., complicating shipping, storage, and installation. 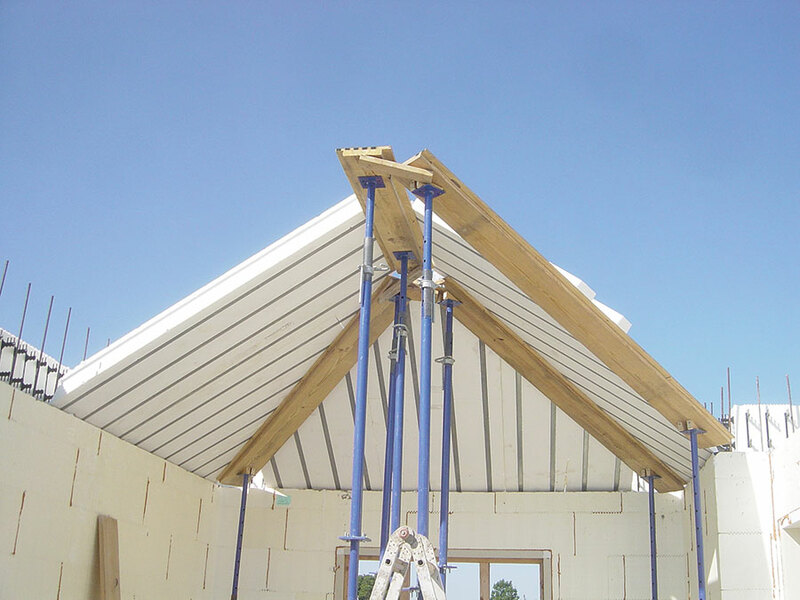 Fortruss, by Beaver Plastics, consists of a U-shaped beam form and a bridge panel. The beam form is wrapped light-gauge steel for attaching finishes. Beaver Plastics, a major shareholder in Logix ICF, introduced a floor system in 2011 they call Fortruss. It’s a two-component system. The first is a foam U-channel 10 inches wide, and custom cut to the length required. It’s available in various depths, depending on the depth of the beam pocket to be formed. Appropriately called the beam form, it’s sheathed in light-gauge steel, and installed every 18 inches on center. The second piece, the panel, bridges the space between the beam forms. The product can be used to create clear spans of up to 40 feet. Shoring isn’t required for spans of less than 10 feet. Otherwise, install shoring every six feet on center. Installation is straightforward, as all of the systems mentioned in this article offer extensive technical support, and have engineering details available showing how to make connections to ICF walls. The bigger issue is engineering the reinforcing steel and shoring requirements. Interior finishes are installed just like they would be in ICF walls. Chases and light boxes are cut in with a hot knife, and sheet rock is attached to the integral furring strips. Sometimes, a dropped ceiling—similar to commercial construction—is installed. 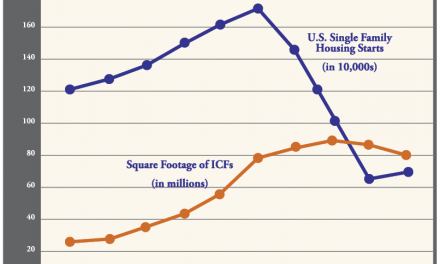 In most areas of the country, the installed cost run $10 to $18 per sq. ft., about double the cost of a conventional wood truss roof, but they offer numerous advantages. As a roof, it will protect belongings and occupants from hurricanes and tornadoes, and is completely fireproof. They can support an enormous amount of weight, so concrete roofs can be converted into decks, rooftop gardens, or even additional parking space. And just like ICF walls, the combination of foam and concrete offer extreme energy efficiency and reduced sound infiltration.